On their debut album Turning Jewels Into Water use rhythm as a point of convergence between the ritualistic origin of music and its current digital presence. Influences in music can take the form of a time graph, filled with numerous nodes. It is most common to find current artists finding inspiration in neighboring nodes, one or maybe two decades back. But there are other times when an artist will travel further down the graph, back to a point of origin. At this stage, there are usually two options. Either follow the orthodoxy of the tradition and faithfully replicate it, or more interestingly alter it and make it your own. Turning Jewels Into Water is one of these rare examples where artists not only travel further down this time graph, but they also expand on the concepts and motifs of one tradition, delivering their own interpretation. And so, drummer/producer Ravish Momin and electronic percussionist Val Jeanty join forces as Turning Jewels Into Water to perform this exercise in merging the past with the present. The duo's vision was already showcased in part with their debut EP, Which Way Is Home?, and they now return with a complete offering in their debut record Map of Absences. Given the background of the two musicians, it comes as no surprise that this record is built around the percussive dimension. Using cutting edge percussive tools, including smart triggers, drum pads, and MIDI controllers, it is the duo's vision to augment the acoustic drum kit. It is through this exploration that Turning Jewels Into Water find a place where the ritualistic origins of music and rhythm meet with the digital realm. As a result, this is a surprisingly rhythmically complex and dense work, and that becomes abundantly clear from the start of "Azul" and its labyrinthine progression. And it is within this barrage of rhythmic recitals that the duo's ambitious vision comes full circle. In bridging the past and future Turning Jewels Into Water create a type of temporal dissonance, as modern techniques invade past traditions. The use of turntablism in accordance with modern DJing practices infects the ritualistic procedures. Vocal samples are used to replace the big chants, resulting in an impressive sonic collage in "Dark Waters Rushing In". Even the tribal spirit of music is subsided to this anamorphosis, with the duo transfiguring its primal core for a multifaceted rendition in "Cave Rain Drumming in My Ear". Through this exploration Turning Jewels Into Water step into some intriguing side effects. One is the sense that many of the ideas of the record sound reminiscent to some old-school futuristic video game. And one where the rules and progression are too complex to follow. The bass line at the end of "Warm Winds from Jaipur" is such a moment, awakening a mysterious, menacing quality that screams of the '80s. Similarly, the title track follows this pattern but adds a layer of playfulness to produce a lighter result. Still, this retro approach is not isolated to the progression of the bass line. The hazy manifestations of tracks like "Warm Winds from Jaipur" display a psychedelic twist that is in accordance with the ritualistic origins of music. This fume-like essence brings forth one of the more interesting moments of the record, with the duo allowing a laid-back tone to prevail over the frenetic performance. Still, when the duo inject this psych twist into the energetic momentum, the result is bitter, as is the case with "Dark Waters Rushing In". 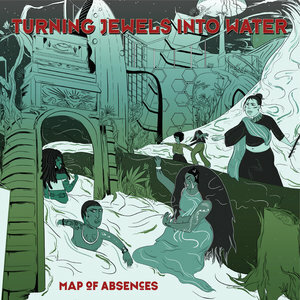 Map of Absences is an ambitious work and one that reveals the grand vision of Turning Jewels Into Water. Still, the duo is capable of also binding these impenetrable structures with slightly lighter motifs. The push towards rave-like motifs is very nicely adapted to that effect, while at other times a post-club rendition prevails. It is a nice cherry on top for an already impressive work.